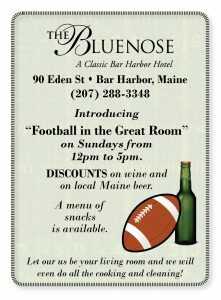 In case you missed it, the Bluenose Inn in Bar Harbor is open for an extended Fall Season through December 21st. It will be open on weekends with various theme dinners, a spa weekend and more. In addition, the Romance on the Coast Package will be available on weekends for the entire season (includes lodging, breakfast and dinner for two). Book your Holiday Party at the Bluenose Inn any day of the week between December 1st and 19th. The Eden Spa will be open all-week by appointment. As an added bonus, the Great Room at the Bluenose will be open on Sundays from 12pm to 5pm for “Football in the Great Room.” Watch your favorite team or keep up with your Fantasy league. Discounts on local beer and on their wine selection. A snack menu will also be available. Recently, AARP (American Association of Retired Persons) listed Bangor, Maine as one of the best cities to retire on $30,000 a year. Reasons listed include: low-cost attractions, abundant recreation and entertainment.